"...The expansion takes you to the northernmost town of Lonelywood, one of the Ten Towns in the region. Native barbarians have been organizing hordes of warriors to sweep across the region razing each of the Ten Towns in their wake. A mysterious traveler enlists the aid of your party to help stop what he believes is a grave mistake. For the sheen of gold, or the principle of justice, it is up to you to stop the storm of conflict. And of course, there's much more to it than that, but hey! 5 main new areas, including Lonelywood, another of the Ten-Towns in the Icewind Dale region. Over 100 new magic items to find. 59 new spells, for both lower and higher level characters. 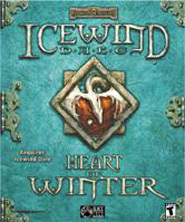 Playable during or after the original Icewind Dale. 10 - 20 new monsters and NPC's, from barbarians, to new undead, as well as some special monsters. " The Trials of the Luremaster add-on.